Imagine that. In the space of one year, the number of victims of trafficking declined by 7 million in an official U.S. government report. But not to worry. There’s something called the Global Slavery Index (GSI), which received fawning publicity, including in The Washington Post. In 2013, the GSI, sponsored by the Walk Free Foundation, estimated that there were 29.8 million people in “modern slavery” around the world. In November 2014, the GSI unveiled what it described as a more precise estimate: 35.8 million people. That’s an increase of 6 million people! What’s going on here? When the State Department set up its office on trafficking in the early 2000s, the numbers were much more modest. The Department’s 2002 report provided an estimate that “at least 700,000, and possibly as many as four million men, women and children worldwide were bought, sold, transported and held against their will in slave-like conditions.” At the time, the George W. Bush administration was largely focused on highlighting anti-prostitution efforts. In an example of how definitions matter, 9.1 million of the estimated victims in the ILO report were moved internally or internationally. “The majority, 11.8 million (56 percent), are subjected to forced labor in their place of origin or residence,” the report said. This brings us to the Global Slavery Index. Bales no longer stands by his estimate of 27 million, saying it dates from the 1990s, and points to the GSI as more accurate. (He is the lead author.) But the GSI figure has come under attack from other researchers for having a murky, inconsistent and questionable methodology. The Walk Free Foundation, founded in 2012 by Australian billionaire Andrew “Twiggy” Forrest, says it wants to eliminate slavery in a generation. The GSI not only provides a total but purports to show how many “slaves” are in each country. GSI relies on an expansive definition of slavery, but confusingly it relies on primary and secondary data that was collected under different definitions. The data are relatively sparse, but the GSI extrapolates from existing numbers to make calculations in what it deems are similar countries. Essentially, researchers extrapolated from 19 countries to come up with precise statistics for the 167 countries that make up the index. Thus data for the United States is considered relevant to calculate Italy’s total of 11,400 slaves, for instance. South Africa’s number of slaves — supposedly 106,000 — was derived from the fact that GSI researchers decided the country is 70 percent “Western Europe” and 30 percent “African” (specifically, an amalgam of Ethiopia, Nigeria, Niger and Namibia). But Andrew Guth, who wrote critically of GSI’s methodology, notes that the Gallup polling, if taken at face value, demonstrated that some of the index’s previous estimates were off course. Ethiopia turned out to have a prevalence level five times lower than the year before — while Russia was deemed to be two times higher. It is beyond the scope of this column to assess the merits of this debate, which largely is between experts such as Ronald Weitzer of George Washington University, who advocate for careful studies of local problems, and those such as Bales, who press for macro-level estimates. Clearly there is a problem with the numbers when the U.S. government cites a figure of 20 million and a well-funded, media-savvy organization touts a figure of “slaves” that is almost twice as high. Advocates want to call attention to a serious problem, and big numbers of course attract media attention. But these guesstimates remain too shaky to be cited without a healthy dose of skepticism. 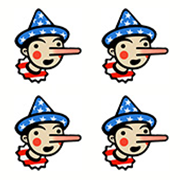 The estimates may be done in good faith, so these Pinocchios are for all-too-credulous acceptance of them.